Q: What should I wear when I get an exfoliation? A: Again, whatever makes you comfortable. Some clients will wear a bathing suit or undergarments when they are getting an exfoliation. If using undergarments, bring an extra pair along. Q: What should I wear when I come in for a massage? A: We provide a robe and slippers for your convenience however, if you feel more comfortable, undergarments may be worn. Q: Are the body wraps for detoxification purposes or for weight loss? A: They are for detoxification purposes to release toxins in the body, replenish minerals and hydrate your skin, not designed for weight loss. Q: Do you offer any other treatments besides massage and exfoliation? A: Yes. We have mineral mud wraps, botanical seaweed wraps, cellulite busters and Shiro D’hara. A: A hot stone massage is a luxurious and relaxing massage combined with heat therapy. Polished basalt lava stones are warmed and incorporated into the massage. The combination of heat with the pressure of the strokes helps penetrate into the muscle tissue inducing deep relaxation. A: You can get a massage from every week to once a month. Q: Is the spa for me if I am pregnant? A: Yes. Even though you should avoid using deep heat or pressure. We would like to recommend our Mothers to be Massage. Please inquire about appropriate facials and body treatments, as well. Q: What is the difference between a deep tissue massage and an Imperial signature massage? A: A deep tissue massage is a more intense pressure massage for tight muscles or injuries. An Imperial signature massage is a Swedish massage, which has less pressure and is great for relaxation and circulation. Brazilian Blowout is an amazing, in-salon treatment that takes approximately 90 minutes and the result lasts for 10 to 12 weeks. Unlike other Brazilian keratin treatments, this product is washed off clients’ hair at the end of the treatment, eliminating the 48 to 72 hours wait time. Clients leave the salon with beautiful, frizz-free hair with amazing shine. 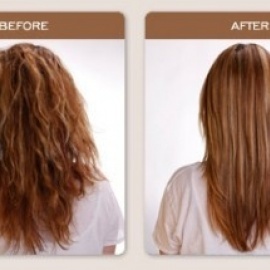 Brazilian Blowout is a cumulative process; the more treatment you have, the longer lasting the result. To further prolong the result of this treatment, the use of the Brazilian Blowout exclusive aftercare product line is strongly recommended. This product line consists of Shampoo, Conditioner, Leave-in Conditioner and Deep Conditioning Masque. This revolutionary treatment is beneficial and suitable for all hair types, especially for damaged and chemically processed hair because it enhances the absorption of the Brazilian Blowout solution. Q: What type of facial do I want if I just want to relax and rejuvenate my skin? A: The Imperial Signature Facial, of course! Q: What treatment is recommended for the lightning of Hyperpigmentation (age/sun spots)? A: Glycolic Peels or Microdermabrasion. Consult your Esthetician to decide which treatment would benefit you more. Q: In order to receive any type of hair removal service does the hair need to be a certain length? A: Yes. At least a 1/4-inch long. Q: Can I shave my legs the day of an exfoliation? A: An exfoliation can sting freshly shaved legs and make your appointment uncomfortable. Q: How do I care for my skin following a Microdermabrasion treatment? A: Cleanse as normal using a non-abrasive cleanser, no uses of manual exfoliants or retinol products are necessary until treatment or series of treatments are completed. Also, try to avoid the sun and use no less than an SPF 30. Keratin Complex has changed the beauty industry – starting with their “signature” Smoothing Therapy and continuing with a complete range of products and styling tools. 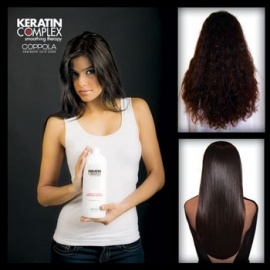 Since its launch in 2007, Keratin Complex has led the way with innovative technology and amazing results. It is no wonder Keratin Complex is now the leading smoothing system in the World! Keratin Complex is not a straightener, but does give stronger results than many other keratin treatments, and for this reason we call it “demi-permanent” rather than “semi-permanent”. The results can linger for as long as 4-6 months. Unlike Brazilian Blowout, this product remains in the client’s hair for three days, after which the client will return to the Salon for a complementary shampoo and blowdry. Clients leave the salon with beautiful, frizz-free hair with amazing shine. To further prolong the result of this treatment, the use of the Keratin Complex exclusive aftercare product line is strongly recommended. This product line consists of Shampoo, Conditioner, Infusion, and Intense Rx. This Award Winning treatment is beneficial and suitable for all hair types, especially for damaged and chemically processed hair. Q: Will I receive an at home agenda from my Esthetician to keep my skin looking great at home?